One Hundred Years of Solitude Research Papers delve into a novel by Gabriel Garcia Marquez that blends the real world with the supernatural world. In One Hundred Years of Solitude, Gabriel Garcia Marquez seamlessly blends the real with the supernatural, allowing the reader to be transported on a century-long odyssey. Although most of his works are fictional, Marquez admits that “all my writing has been about the experiences of the time I spent with my grandparents”. 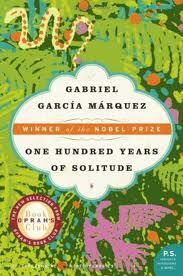 In fact, Marquez ended up writing One Hundred Years of Solitude as if his grandmother was telling the story. Marquez’s grandmother told her stories “with a brick face” , which meant her facial expression never changed. Her stories contained elements of both the real and the supernatural. To Marquez, her “brick face” meant that she believed completely in her stories, and that was how he set out to write his story. Being a cynical person by nature, I was surprised how Márquez had me believing in magic and the supernatural throughout the novel. Normally, when I read a piece of literature, I rely on the writing to enhance my belief in the story. The novel is full of supernatural occurrences that fit into the story so well they appear logical. I cannot recollect a novel that I have read twice back to back in a short space of time. I found that I was so eager to see what befell the characters next that I raced through the book once and then read it again more slowly. The novel is so rich that each time I read it; I discover something new and interesting. She would have been growing up during a period of nearly constant civil wars in Colombia. The there is an underlying theme of war throughout the novel as well. The story itself reflects the social and political climate in Latin America during the civil wars. A Very Old Man with Enormous Wings - Essays on A Very Old Man with Enormous Wings examine the story written by South American author Gabriel Garcia Marquez. Paper Masters writes custom research papers on One Hundred Years of Solitude and delve into a novel by Gabriel Garcia Marquez that blends the real world with the supernatural world.